DISCOUNTED 5 DAY IOWA DEER ANY WEAPON GUIDED AND SEMI GUIDED 10,000 PRIVATE ACRES OF RIVER BOTTOMS WITH CORN AND BEAN FIELDS, ALSO TURKEY. Let us set a schedule where you can hunt premium seasons until you draw. In the inter hunt prime locations in Missouri and Nebraska where the licenses are over the counter until your Iowa points pull you through. ALSO SINCE IOWA IS A DRAWING NIGHMARE REQUIRING 3 OR MORE POINTS IN SOME ZONES, WE CAN BOOK YOU JUST ACROSS THE IOWA BOARDER IN MISSOURI AT 5 DIFFERENT FARMS. IN THIS WAY YOU GET THE IOWA POINT AND GET TO HUNT PRIME DEER AREAS ON A $225 LISENCE. DISCOUNTED 5 DAY IOWA DEER ANY WEAPON GUIDED AND SEMI GUIDED 10,000 PRIVATE ACRES OF RIVER BOTTOMS WITH CORN AND BEAN FIELDS, ALSO TURKEY. WE CAN HELP YOU WITH THE DRAW AND IF YOU DON'T DRAW WE WILL PROVIDE YOU WITH A DISCOUNTED HUNT ON THE MISSOURI SIDE OF THE IOWA BOARDER FOR ONLY $1995, SEMIGUIDED, MEALS, LODGING INCLUDED. IN THIS WAY THE WORSE YOU CAN DO IS GET AN IOWA PREFERENCE POINT AND A MISSOURI BUCK. 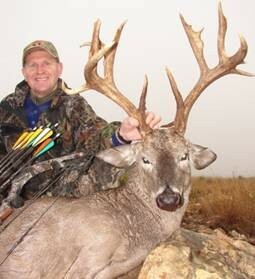 IF YOU DRAW THE IOWA TAG YIOU CAN USE YOUR BOOKING TOWARD LODGING AND MEALS IN IOWA HUNTING THE WHITETAIL THERE. IT'S A WIN/WIN OPPORTUNITY. ALSO IN MISSOURI YOU CAN ALSO USE A RIFLE INSTEAD OF A SHOTGUN OR MUZZLELOADER! I guess you can say that Missouri is a plan B for hunting but you will have a Iowa point and a Missouri Buck! Space is limited for areas for me to do this so I will have a limited number of hunters that I can provide this offer. For these big Iowa Monster whitetail hunters we have ways to get you a license to get your Iowa dream buck. Iowa is known for their record book bucks; we have a way that you can get a license and hunt this prestigious state for a wall hanger with lodging at a semi- guided price that is 30% of what most outfitter charge. We provide meals and lodging. You will be hunting out of tree stands, ground blinds or other cover at trail crossings between feeding and bedding areas, depending on where out scouting finds the biggest bucks at the time of your hunt. Iowa’s secret to big bucks is high protein feed like Soybeans (30% protein), Corn (7% protein) for feed, cold weather to naturally cause them to bulk up in nature, and 1 to 2 years older average age group than other states, plus a good base of wood lots and other heavy cover for thermo-protection and danger evading cover, along with a high percentage of private land. We have too many bucks and need to thin the biggest ones so they don’t get pushed off the property by so many bucks in that age class. They will be hunting the shotgun or muzzleloader season. Only 4 spots left and when they are gone they are gone. Deposit made to hold your place and if by unlikely odds you don’t draw deposit will be rolled over for next year when you have a 100% chance of drawing. We also have premium quality land in Missouri just south of the Iowa Boarder. We can put in for Iowa and if you don’t draw you will get a point and then we can book you for Missouri. Hunting Location: Russell, Iowa-Zone 1,2,4,5,7 and others. Opportunity/success 99.9% shot opportunity; success depends on weapon selected. All dates are approximate until Iowa DNR Confirms their hunt schedule for this year. Non-Refundable Deposit of $1000 is required when booking with the balance due 30 days before the hunt.